At the beginning of the 20th century, Greek and foreign researchers initially and then the Institute of Geological and Mineral Exploration and various Universities initiated a long geological research creating a significant cognitive infrastructure with regard to the geological structure of Greece. Various geological processes contributed to the shaping of the environment characteristics. The physiographic image of Greece is shaped by unique natural monuments which were framed by myths, legends and beliefs. Due to its location in the convergence space between two tectonic plates (African and Eurasian) Greece is one of the most active and “vivid” sites of the world and therefore has a variety of past or “nascent” geological formations, geoforms, geological processes having both particular scientific or educational value attracting strong international interest, as well as high cultural and tourist value. The geodynamic processes that have occurred over geological eras have created complex structures of extraordinary beauty and uniqueness that can be truly characterized as real nature monuments. Such forms are scattered across the entire country and most of the times they constitute places of admiration, pleasure and observation. From now on, these monuments shall be called Geosites. Under certain conditions, complexes of geosites can form a Geopark. 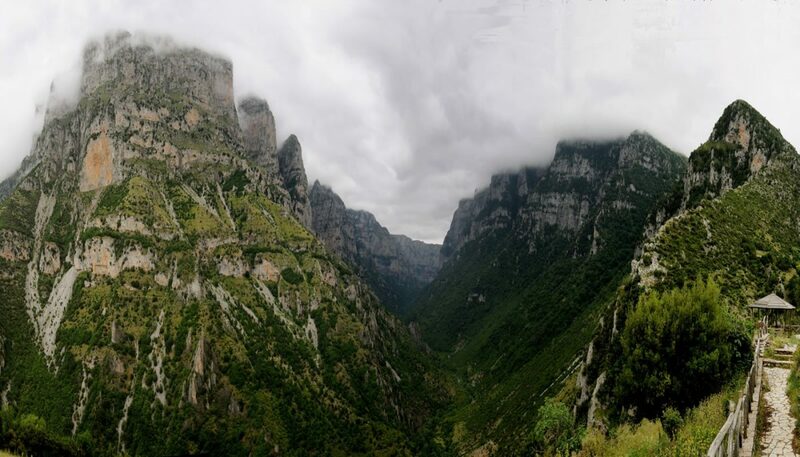 The Vikos-Aoos Geopark was founded in 2010. The initiative to establish a recognized area for its geological and geomorphological value belongs to the Institute of Geology and Mineral Exploration (IGME), which since 2005 has began to set the conditions for its establishment. “Epirus Development Agency S.A. (Epirus S.A.)” supported this great effort and offered its help in all stages of the study, and mostly at the final stage regarding the creation and submission of the application file for membership to the European and Global Geopark Networks under the auspices of UNESCO. The project was implemented in the framework of the Third Community Support Framework (2000-2006) and it was included within the Operational Programme “Competitiveness” (EPAN). Initially the program included the recording of individual geosites and then the establishment of a Gesosites bank. By applying a set of criteria geosites sets or networks were chosen fulfilling the necessary requirements for an area to be characterized as Geopark. The wider area of the Vikos – Aoos National Park includes a satisfying set of geosites with important geodiversity. It combines geomorphological, hydrogeological, stratigraphical, tectonical, sedimentological and prehistorical features which can be directly observed so as to understand the geological processes that have taken place over time. Then the complete file was submitted to the European Geoparks Network of UNESCO, accompanied by an application to be a part of this Network. Finally, on 1st October 2010 during the 9th European & 4th World Conference on Geoparks held in Mytilini on 1-5 October 2010 with the participation of representatives of Epirus S.A. and IGME, a formal event took place for the establishment of new Geoparks of the UNESCO Network; Vikos-Aoos Geopark was one of them. The establishment of the Vikos-Aoos Geopark contributes to the overall promotion of the geological framework for scientific, educational and pedagogical use while it enhances and improves the area`s tourist product. This effort aims at highlighting the geological parameters and their involvement in shaping the area`s landscape, natural environment and culture.